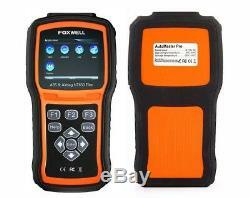 ABS Airbag SRS Reset Tool OBD2 Car Code Reader Scanner Diagnostic Foxwell NT630. 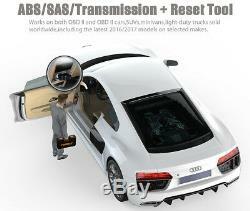 ABS(Anti Lock Brake System) and Airbag Reset Tool. Does not only have extensive coverage of vehicles but also provides accurate and professional diagnosis of ABS and airbag faults. SAS Steering angle Sensor Reset. 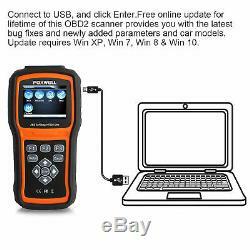 Universal OBD II Scanner Car Engine Fault Code Reader CAN Diagnostic Scan Tool, Read and Clear Error Codes for 1996 or Newer OBD2 Protocol. Reads and clear codes and turns off ABS/Airbag warning indicator. 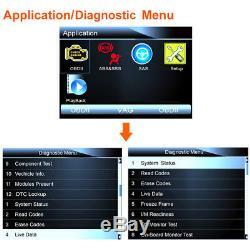 Diagnostic and Reset SAS system. Live vehicle sensors data in text and graph format. And allows you to focus on any suspicious or symptom-specific data. You can view 2 parameter graphs simultaneously and merge them into one coordinate, so you can easily see how they affect each other, providing you with the most comprehensive and functional look at live data possible. 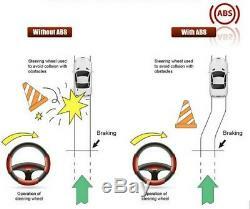 It allows you to use the scan tool temporarily activate or control ABS/airbag system or component. Check of electronic components such as switches, sensors, relays & actuators is made a. Saving your time and labor costs. Multilingual menu options and code definitions for an international marketplace. English, French, German, Spanish and Dutch. Clearly arranged keypad, menu-driven operation, shortcuts and impressive color display together make the series extremely easy to use. Strong housing and protective rubber boot for resisting impact and damage. A rubberized sleeve protects your investment. 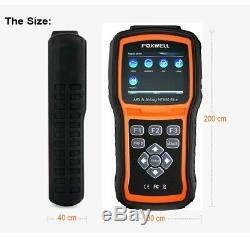 Foxwell NT630 Elite Special Functions. Allows to manually control the actuators in order to test ABS motors. Solenoids, solenoid enable relays, EMBs, and more. Allows to manually control the ABS pump motor. Displays the name of the brake system and the ABS controller version number, software ID. Actuator Tests Allows to manually control the actuators in order to test AYC valves, inlet valves. Outlet valves, pump motors, and TRACS valves. Automated Bleed, or Service Bleed removes air from the internal brake fluid chambers after. 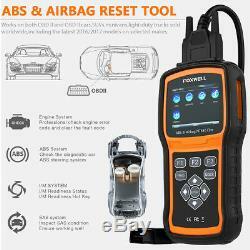 Read Airbag codes, the scanner finds out the airbags codes, points out the problem help you to fix it. Clear Airbag codes, the scaner erease the airbag code and turn off the airbag lights. 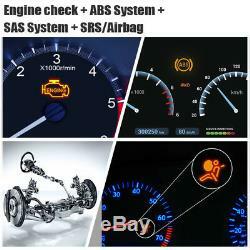 "OBDII Engine Test & ABS & Airbag " Support Car List. Update requires Windows system Win XP, Win 7, Win 8 & Win 10. With internet access, you will always have the latest bug fixes, new vehicles, newly added parameters and functionality at your fingertips. The application does all the work, syncing the latest software to your tool. Display: Backlit, 240320 TFT color display. Working Temperature: 0 to 60 (32 to 140). Storage Temperature: -20 to 70 (-4 to 158). External Power: 8-18 Volts powered by vehicle battery. Offer 100% and High Quality Original Product. 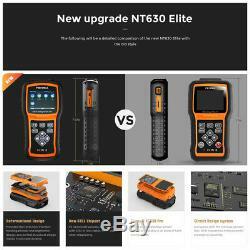 1 pcs x NT630 elite Scan Tool. 1 pcs x User's Guide. 1 pcs x Memory Card. 1 pcs x USB Cable. 1 pcs x Diagnostic Cable. 1 pcs x Blow Molding Case. If your package delayed few days, due to any unexpected factor, please wait patiently. Your kind understanding would be highly appreciated! If after 7 days, or the item has been used, we have the right to decline your claim. A professional worldwide company, with own factory located in China. We contribute to producing the high quality auto dianostic tool. So we can give our dear customer a professional support. Please keep the items in an unused condition. We hope you can tell us your suggestions and pictures about the flaws. We promise to help you solve it asap, and make you feel satisfactory absolutely. After you received our package you are satisfied with it. We will do the same as soon as we can too. 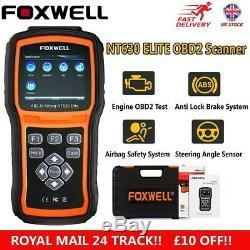 The item "ABS Airbag SRS Reset Tool OBD2 Car Code Reader Scanner Diagnostic Foxwell NT630" is in sale since Friday, August 17, 2018. 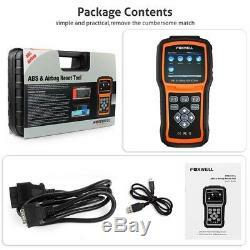 This item is in the category "Vehicle Parts & Accessories\Garage Equipment & Tools\Diagnostic Equipment & Tools\Other Diagnostic Service Tools". The seller is "kingdomsales18" and is located in Glenfield. This item can be shipped to all countries in Europe. Function 1: OBDII Engine Check,read/clear codes,live data,etc.